Traffic death rates are three times greater at night than during the day. Traffic death rates are three times greater at night than during the day, according to the National Safety Council. Yet many of us are unaware of night driving’s special hazards or don’t know effective ways to deal with them. Driving at night is more of a challenge than many people think. It’s also more dangerous. Why is night driving so dangerous? One obvious answer is darkness. Ninety percent of a driver’s reaction depends on vision, and vision is severely limited at night. Depth perception, color recognition, and peripheral vision are compromised after sundown. Older drivers have even greater difficulties seeing at night. A 50-year-old driver may need twice as much light to see as well as a 30-year old. Another factor adding danger to night driving is fatigue. Drowsiness makes driving more difficult by dulling concentration and slowing reaction time. Traffic crashes that include at least one driver or motorcycle operator with a blood alcohol concentration of .08 g/dl or greater account for about 32% of total traffic fatalities. That makes weekend nights more dangerous. More fatal crashes take place on weekend nights than at any other time in the week. 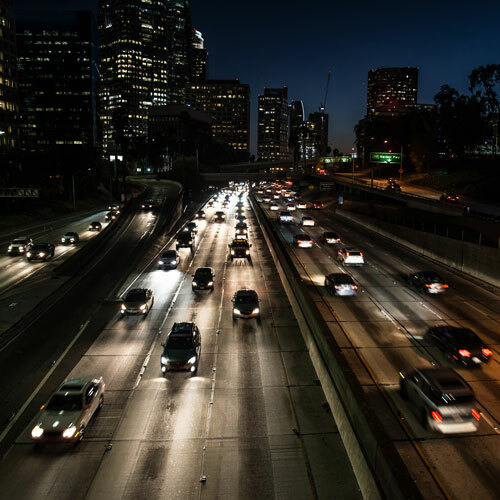 Fortunately, you can take several effective measures to minimize these after-dark dangers by preparing your car and following special guidelines while you drive. Prepare your car for night driving. Clean headlights, taillights, signal lights and windows (inside and out) once a week, more often if necessary. Have your headlights properly aimed. Misaimed headlights blind other drivers and reduce your ability to see the road. Don’t drink and drive. Not only does alcohol severely impair your driving ability, it also acts as a depressant. Just one drink can induce fatigue. Avoid smoking when you drive. Smoke’s nicotine and carbon monoxide hamper night vision. If there is any doubt, turn your headlights on. Lights will not help you see better in early twilight, but they’ll make it easier for other drivers to see you. Being seen is as important as seeing. Reduce your speed and increase your following distances. It is more difficult to judge other vehicle’s speeds and distances at night. Don’t overdrive your headlights. You should be able to stop inside the illuminated area. If you’re not, you are creating a blind crash area in front of your vehicle. When following another vehicle, keep your headlights on low beams so you don’t blind the driver ahead of you. Make frequent stops for light snacks and exercise. If you’re too tired to drive, stop and get some rest. If you have car trouble, pull off the road as far as possible. Warn approaching traffic at once by setting up reflecting triangles near your vehicle and 300 feet behind it. Turn on flashers and the dome light. Stay off the roadway and get passengers away from the area. Observe night driving safety as soon as the sun goes down. Twilight is one of the most difficult times to drive, because your eyes are constantly changing to adapt to the growing darkness. Information and recommendations are compiled from sources believed to be reliable. The National Safety Council makes no guarantee as to and assumes no responsibility for the correctness, sufficiency or completeness of such information or recommendations. Other or additional safety measures may be required under particular circumstances.